Square Road Sign Frame 600mm. Manufactured from 25mm x 25mm x 3mm angle mild steel and have fo..
Square Road Sign Frame 750mm. 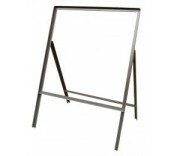 Manufactured from 25mm x 25mm x 3mm angle mild steel and have fo..
Square Road Sign Frame 900mm. Manufactured from 25mm x 25mm x 3mm angle mild steel and have fo..
Square Road Sign Frame 1200mm. Manufactured from 25mm x 25mm x 3mm angle mild steel and have f..